Rembrandt was one of the most important artists of the great age of Dutch painting. In range, originality, and expressive power, his large production of paintings, drawings, and etchings has never been surpassed. Rembrandt Harmensz van Rijn was born in Leiden, Netherlands, on July 15, 1606, next to the last of the nine or more children of a miller, Harmen Gerritsz van Rijn, and a baker's daughter, Cornelia Neeltgen Willemsdr. van Zuytbroeck. For seven years Rembrandt was a student at the Latin school, and then, in 1620, he enrolled at Leiden University at the age of thirteen. After only a few months, however, he left to pursue his true passion—painting. He was an apprentice (a person working to learn a skill) for three years to the painter Jacob Isaacsz van Swanenburgh, who had studied in Italy. In 1624 Rembrandt went to Amsterdam to work with Pieter Lastman, a painter of biblical, mythological, and historical scenes. After Lastman's death in 1633, Rembrandt continued to use his teacher's subjects and motifs (dominant themes). It was Lastman's ability to tell a story visually that impressed his youthful pupil. The earliest known works by Rembrandt, beginning with the Stoning of St. Stephen (1625), show an only partially successful imitation of Lastman's style, applied to scenes in which a number of figures are involved in a dramatic action. By 1625 Rembrandt was working independently in Leiden. He was closely associated at this time with Jan Lievens (1607–1674), also a student of Lastman's. The two young men worked so similarly that even in their own lifetime there was doubt as to which of them was responsible for a particular painting. They used the same models and even worked on each other's pictures. By 1631 Rembrandt was ready to compete with the accomplished portrait painters of Amsterdam. His portrait of the Amsterdam merchant Nicolaes Ruts (1631) is an amazing likeness executed with a degree of assurance that makes it clear why its author was in demand as a portraitist (an artist who draws or paints a person, usually the head and shoulders). Around 1631 or 1632 Rembrandt moved to Amsterdam, where he had already achieved some recognition as a portraitist. Both his career and his personal life prospered. After an engagement of more than a year, he married a well-to-do young woman, Saskia van Uijlenburgh. In 1639 the young couple set themselves up in a fine house in the Breestraat, now maintained as a museum, the Rembrandthuis. Like many wealthy men of his time, Rembrandt soon began to collect works of art, armor, costumes, and curiosities (unusual trinkets) from far places. He used some of these objects as props in his paintings and etchings (images that are the result of transferring an image off a metal plate onto paper with the use of chemicals). Rembrandt's works of the mid-1630s were his most baroque, an elaborate style developed in the sixteenth century; indeed he seemed to be purposefully challenging the enormous reputation of painter Peter Paul Rubens (1577–1640). This is most expressed in the scenes from the Passion of Christ (1633–1639). The etching Angel Appearing to the Shepherds (1634) shows how the same drama and excitement, the combination of fine detail with a grand new sweep based largely on bringing together the composition through light and shadow, and the choice of the crucial moment—all characteristic of Rembrandt's baroque style—showed in his graphic works as well as his paintings in this period. One of Rembrandt's largest and most famous paintings is the group portrait known since the mid-eighteenth century as the Night Watch. This is, in fact, not a night scene at all, and it is correctly titled the Militia Company of Captain Frans Banning Cocq. The painting was unfortunately cut down in the eighteenth century. There is no foundation at all for the legend that Captain Cocq and his company were unhappy with their painting and that this failure began a decline in Rembrandt's fortunes that lasted until the end of his life. In fact, there is considerable evidence that the picture was highly praised from the start. Such difficulties as Rembrandt had were not caused by any rejection of his work. Having had three children who died in infancy, Saskia gave birth to a fourth child, Titus, in September 1641. In June 1642 Saskia died. Geertge Dircx then entered Rembrandt's household in order to take care of Titus. 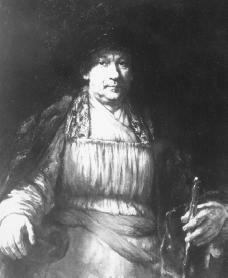 Hendrickje Stoffels, who is first mentioned in connection with Rembrandt in 1649, remained with him until her death in 1663. She left a daughter, Cornelia, who had been born to them in 1654. About 1640 Rembrandt developed a new interest in landscape which lasted through the next two decades. A series of drawings and etchings show keen observation of nature, great originality in composing, and marvelous economy. The etched View of Amsterdam (c.1640) influenced the landscape paintings of Jacob van Ruisdael (c.1628–1682). The tiny painting Winter Landscape (1646) has all the earmarks of having been painted from life, on the spot. This would be a rare case in seventeenth-century Dutch landscape, which usually was painted in the studio from sketches. The first Anglo-Dutch War (1652–54; when England battled the Dutch Republic) may have played a part in Rembrandt's financial difficulties, of which there is evidence from 1653 on. All of his prized possessions were sold at auction, beginning in December 1657, and three years later Rembrandt, Titus, and Hendrickje moved to a smaller house. In 1652 a Sicilian nobleman who was a discerning (selective and shrewd) collector commissioned a painting from Rembrandt. If the painting was satisfactory, two more were to be ordered. Aristotle Contemplating a Bust of Homer was completed in 1653 and shipped off to Sicily, and the two additional pictures were sent in 1661. The meaning of the Aristotle is not yet fully understood, but its quality is unquestionable. Rembrandt's Self-Portrait (1658) shows the aging artist seated squarely before us, meeting our eyes with forthright gaze, and wearing a fantastic costume whose sharp horizontals and verticals stress the composition based on right angles that best represents this period. A number of admirable etched portraits also date from this time, as well as etchings of religious subjects, such as the impressive Ecce homo (1655), which reflects an engraving made in 1510 by the great Dutch graphic artist Lucas van Leyden (1494–1533). In 1660 and 1661 Rembrandt painted an enormous canvas for the splendid new town hall in Amsterdam. It was the Conspiracy of the Batavians, or the Oath of Julius Civilis, known to us through the remaining fragment and a penand-wash drawing of the entire composition. Hendrickje died in 1663. In September 1668 Titus died as well. The lonely Rembrandt continued to paint. His last Self-Portrait is dated 1669. When he died in Amsterdam, on October 4, 1669, a painting, Simeon with the Christ Child in the Temple, was left unfinished on his easel. Bonafoux, Pascal. Rembrandt, Master of the Portrait. New York: H. N. Abrams, 1992. Gerson, Horst. Rembrandt Paintings. New York: Reynal, 1968. Schama, Simon. Rembrandt's Eyes. New York: Alfred A. Knopf, 1999. White, Christopher. Rembrandt and His World. New York: Viking, 1964.